Jumpshot was a cool company even before AVAST Software made them a part of the world’s most trusted antivirus family. 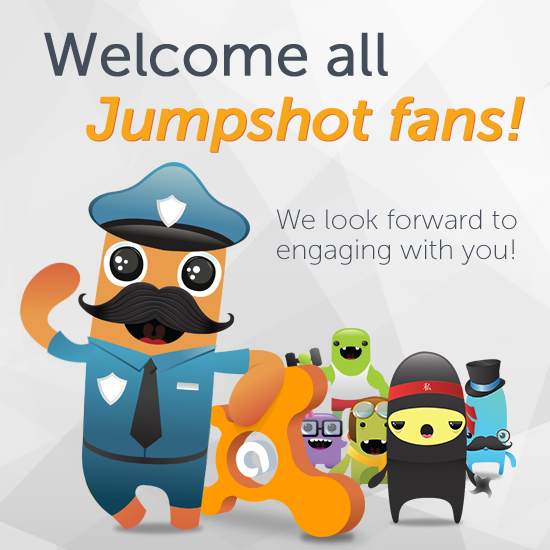 They told us about the awesome fan base following the company, so we're pretty excited to welcome all you cool Jumpshot kids as you make the move from Jumpshot’s current blog, Facebook, Pinterest, and most Twitter accounts to AVAST’s blog and social media outlets. The AVAST social media team shares the latest news, fun facts, and contest information on our Facebook page, on Twitter and Google+. You can also discover news, tips, and advice on the latest security and privacy threats right here on the AVAST blog. As part of the integration into AVAST, Jumpshot’s name has been changed to GrimeFighter. We all agree that it’s a great way to describe the war Officer Pete and his band of minions fight against the grime that accumulates in computers everywhere. Watch this blog and our social media pages for announcements on when GrimeFighter becomes a part of AVAST products. We invite you to continue your relationship with the former Jumpshot here on AVAST. Become an AVAST fan, follower, and blog reader to stay informed about the latest in security and privacy. As you make the transition with us, we ask that you take a look around, and give the most trusted antivirus software in the world, avast! Free Antivirus, or one of our premium paid products a try. You can compare features of our products here, and look for deals at the avast! Store.